London based City Of Thieves are set to make waves in the rock world with the release of their EP ‘Incinerator’ on 22nd September 2015 via Townsend Records. With the band making their live debut at this year’s Camden Rocks Festival – City Of Thieves have also been confirmed for Bloodstock Festival, Legends Of Rock and Planet Rock Radio ROCKSTOCK – expect headline shows and special guest slots to be announced shortly. Since making their live debut at Camden Rocks Festival in May, the buzz is spreading about City Of Thieves – no frills, no messin’, no gimmicks – it’s heavy rock in its purest form and will send you straight to the front of the stage with sledgehammer riffs, hooks and melodies. 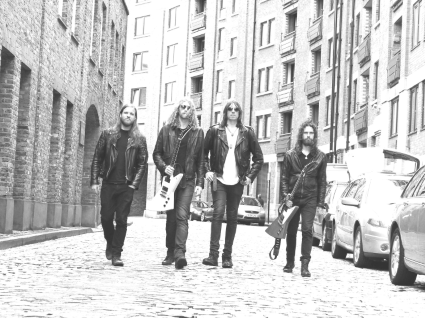 With Planet Rock Radio playlisting ‘Incinerator’ and show announcements happening – City Of Thieves are set to make a name for themselves over the coming months. The EP is just the start with this stellar release from the band, with the debut album scheduled to be unleashed in 2016.